Tawa Paneer Masala (पनीर तवा मसाला) Recipe is a Punjabi dish which is usually cooked on Tawa or a frying pan! Cooking in a tawa gives a unique flavor and consistency to the dish. A semi-dry gravy of paneer cooked in tomato gravy with spices and fresh cream, this masala features an aromatic array of flavors. They are great for chapatis/roti. Serve paneer Tawa masala with hot Rotis or Phulkas and raitha of your choice! Green Chilli – 2 nos. 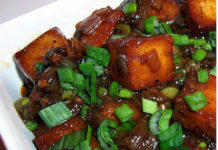 Take fresh paneer and cut large size cubes. Now take a Tawa or Skillet, add a small amount of butter and heat it on medium flame. When the oil is heated add grated garlic, grated ginger, finely chopped green chili and saute for 1 minute on low flame. Add onion and saute it for 1 minute on low flame. Add few pinches of salt which helps in cooking onion fast. Add tomato paste and saute it for 5 minutes on low flame. Add few drops of water to cook tomato fast. When the tomato is cooked add kasuri methi and capsicum saute it for 30 seconds. Add kitchen king masala, Chat Masala, Red Chilli Powder, Coriander powder, turmeric powder and salt and saute it for 30 seconds. Add Paneer cubes, coat it with cooked onion and tomato, which takes 2-3 minute to properly cook. You can add little butter at this stage and switch off the flame. Take it in the serving bowl and garnish with coriander leaves and butter. Tawa Paneer Masala is ready to be served with hot chapati, paratha, naan, crispy poori.